School psychologists are uniquely trained to provide a comprehensive range of services to help students overcome barriers to learning. The Every Student Succeeds Act (ESSA) presents significant opportunities to expand access to comprehensive school psychological services within multitiered systems of support (MTSS). MTSS is a foundational, evidence-based framework for effectively integrating multiple systems and services to simultaneously address students’ academic achievement, behavior, and social–emotional well-being. Exactly how states and local districts choose to structure MTSS under the provisions in ESSA will greatly impact the effectiveness of service delivery. It is imperative that school psychologists actively advocate for and participate in the implementation of MTSS in their schools to facilitate the selection of evidence-based curriculum and interventions, administer psychometrically sound universal screening and progress monitoring tools, support fidelity of intervention implementation, and facilitate appropriate data analysis and interpretation. ESSA provides states and districts with great flexibility to blend various funding streams (e.g., Title I, Title II, and Title IV) to provide high-quality instruction, professional development, and comprehensive learning supports based on the unique needs of the school community. States and districts could also use these funds to implement multitiered systems of support (MTSS). MTSS describes a framework for providing comprehensive systems of differentiated supports. Data-driven decisions regarding instruction and intervention are provided in increasing intensity (i.e., tiers) based on student need. Tier 1, or universal supports, typically refers to services available to all students (e.g., wellness/skills promotion and school-wide programs). Tier 2 services (targeted) are available to some students identified as needing some additional services or supports (e.g., small group counseling, tutoring, targeted behavioral skills training). Tier 3 refers to more intensive services for individuals or small groups and is usually limited to only 5–10% of students (e.g., individualized instruction, intensive therapy, wraparound services). Improve outcomes for all students, including high-performing students, English language learners, students receiving special education services, and those struggling with barriers to learning. Improve instruction and alignment of curricula across general and special education. Create safe and supportive learning environments free from bullying and harassment. Support students’ mental and behavioral health. Implement effective discipline policy and practice. School psychologists are often an untapped resource. When utilized appropriately, we can help schools and districts use limited dollars more effectively while simultaneously improving school and student outcomes. 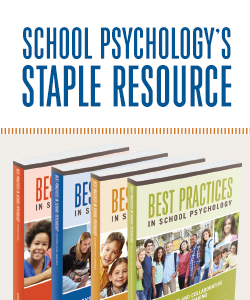 As states, districts, and schools begin to consider various strategies to meet student needs, school psychologists can support the effective development, implementation, and evaluation of multitiered systems of support. School psychologists are trained to design, implement, and evaluate a comprehensive range of interventions for students at risk for academic, social–emotional, or mental and behavioral health concerns. School psychologists are uniquely trained to provide a comprehensive range of services that enable schools to implement comprehensive systems of student supports, improve school and district effectiveness, and support improved outcomes for all students. School psychologists have expertise in collecting and analyzing data that can be utilized in progress monitoring; helping to develop indicators of academic, social, emotional, and behavioral health of students; and utilizing data to assist administrators in developing school improvement plans. School improvement efforts are most effective when parents, families, and the school work together. School psychologists collaborate with parents and families to promote treatment integrity and improve intervention success at home and school. Students with the most significant needs may require wraparound supports available in the community. School psychologists facilitate collaboration and coordination between the home, school, and community providers to promote student success. This handout provides an overview of MTSS in ESSA's provisions relevant to school psychologists.